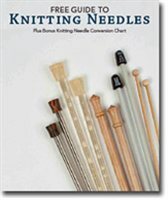 Confused about Knitting Needle Options? There are so many different kinds of knitting needles out there, from circulars, straights and DPNs of different lengths to those made of wood, bamboo, metal, plastic and other materials. How do you know which needle type is right for you and the project you are working on? You can’t try every single needle type that is out there, but once you’ve given a few a test you’ll begin to develop your own preferences (I love wooden straights and circulars and tend to use interchangeables a lot). In the meantime, you can check out the free (with free signup to Knitting Daily) ebook Free Guide to Knitting Needles. This nine-page PDF covers the pros and cons of the major types of knitting needles you’ll find out there and gives some tips for choosing the right type for you. If you like speed, for instance, consider fixed circulars with metal tips. If you love cute stuff, go for candy-colored plastic and acrylics. The guide also includes a chart with the basics on all the models they tested and a handy knitting needle conversion chart, just in case you’re looking at a pattern that calls for a 4 mm needle and you don’t know what that means (size 6 US, by the way).